Just as we have suspended open chords, we have suspended barre chords, containing all the same advantages as regular barre chords. Like barre chords, these shapes are moveable and can be played anywhere on the neck, just look at the bottom note to see what your root is. And like suspended open chords, they can be applied to major, minor, seventh and dominant chords, and likewise resolve to all of those chords. Use these just as you would use suspended open chords to embellish and add flavor to your chord progressions. For a good example, try out California Dreamin’ by The Mamas & The Papas and use the 4th shape in the top row to play the G#7sus chord. Every major scale has a relative minor scale, and every minor scale has a relative major scale. Relative means that both scales contain the exact same notes. C is at the 8th fret. By going one and a half steps below C, we arrive at A. Why does this matter? If they contain the exact same notes, aren’t they the same thing? It matters because even though you’re playing the same notes, the note that you start on makes a big difference in the feeling or the “flavor” of the scale. Play each of these scales, and notice how they sound entirely different even though the same 7 notes are repeated in both patterns. In general terms, major sounds “happy” and minor sounds “sad”. This is a great example of how music generates emotions simply by the way it sounds, and there are specific reasons for this that will be covered in other lessons. Barre chords are often dreaded by beginning guitar players, and many players give up on trying to learn them altogether. This might be the single biggest mistake budding guitar players make, because barre chords are not as hard to learn as most people think, and they are an absolutely indispensable part of playing the guitar. You might start off hating barre chords, but once you get good at playing them – which should only take a few weeks or so – you will come to love them for their sheer versatility, and once you master them, you will wonder how you ever found them difficult. What’s so great about barre chords? Literally, barre chords allow you to play any song in any key, a feat you can’t say for open chords. Yes, a capo can overcome some of those limitations, but then you’re reliant on an external tool that can’t easily be changed during a song. Barre chords circumvent all of these limitations by allowing you to play any type of chord using any root note, meaning you can play every possible chord with only your hand. No capo can match that. How hard are they to learn? Well, I won’t lie. At first, they are difficult. No one ever plays them correctly right at the start. But don’t let this discourage you – look at all the guitar players out there who play them just fine. They all started out like you, and now they’re making barre chords look easy. That means you can do it too. Practice these chords for 5-10 minutes every day, and in a few weeks you will be good enough to play songs with them. At some point, they will become downright easy to play, and you’ll have difficulty remembering why they were ever hard. Have faith and practice – they will get easier and better! To barre, form a vice with your first finger and your thumb, and press down as hard as you need to in order to make all six strings ring. Your thumb should be located approximately in line with your first finger. When you can make all six strings ring with just your first finger, try applying a chord shape with your other fingers. This is where things get really awkward, and chances are you won’t play clean chords at first, but that’s ok! That’s how it is for everyone at first. Keep at it, and soon your finger strength and dexterity will develop to the point that these chords become easy. The major chord on the 5th string deserves special mention. It’s essentially a double barre, consisting of a barre with your first finger and another barre with your third finger, which also has to bend backwards to allow the first string to ring. This chord might seem impossible at first, but it isn’t! It’s just the hardest of the bunch. Practice it like any other and you will get it down too. Learn the following 10 shapes, all of which are moveable, and memorize their names. There are 5 chords with a 6th string root, and 5 chords with a 5th string root. Let’s say you want to play a B major chord. You could choose to play it on the 6th string by simply locating B on the 6th string, then playing the major barre chord (6th string root version) with B as the bottom note. You could also choose to play it on the 5th string by doing the same thing, only locating B on the 5th string and using the 5th string root version of the major barre chord. Many songs will provide you the opportunity to choose 6th or 5th string versions of chords, so try to choose chord shapes that are close to each other and efficient to play. 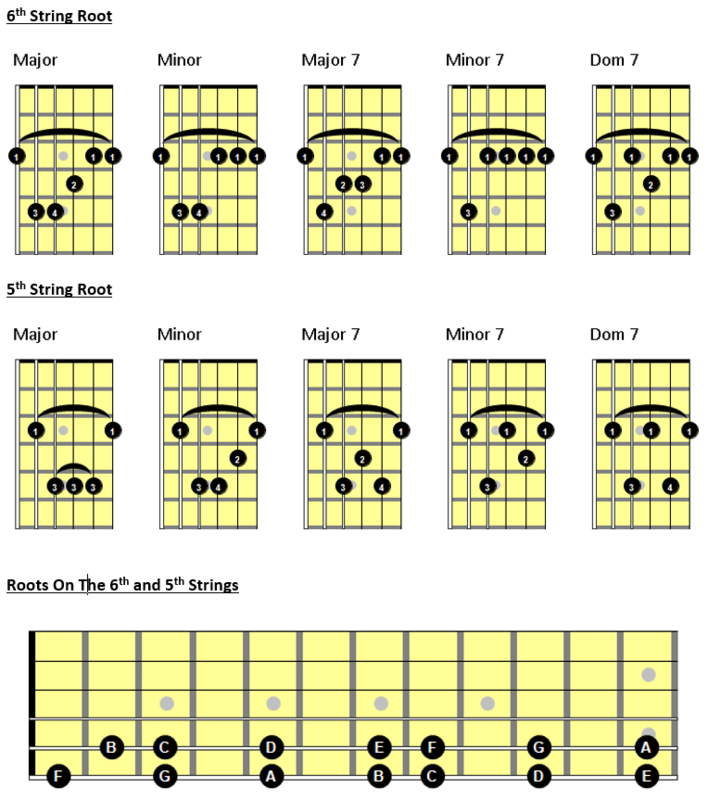 The minor scale is a relative of the major scale, and can also be used to build chords, melodies and harmonies. See the lesson on The Major Scale for tips on how to execute the above techniques. Like the major scale, this pattern is a movable pattern that can be played anywhere on the guitar neck. Whatever note you start on is your root note, which indicates the key that you’re in. We will cover keys more extensively in a separate lesson, but for now, just know that you can play this pattern starting on any note on the 6th string, and that whatever note you start with is the key that you’re in. Scales are simply groups of pitches arranged in ascending order. There is a lot of music theory behind scales that is good to learn, but for starters let’s just learn how to play them. There are many different scales, but the major scale is the most common. The major scale is the foundation upon which virtually all chords, melodies and harmonies are built. To alternate-pick, use a picking pattern that alternates strictly between down and up strokes. Start with a down stroke on the first note, then use an up stroke on the second note, a down stroke on the third note, and so on for the rest of the scale. Continue this alternate picking when coming back down the scale. To hammer-on, play the first note and then while it’s still ringing, quickly and firmly press another finger to play a higher note. To pull-off, do the reverse – play a note, then quickly remove your finger to play a lower note with another finger that is already in place. This pattern is a movable pattern that can be played anywhere on the guitar neck. Whatever note you start on is your root note, which indicates the key that you’re in. We will cover keys more extensively in a separate lesson, but for now, just know that you can play this pattern starting on any note on the 6th string, and that whatever note you start with is the key that you’re in. Scales – ordered sets of musical notes, such as the major scale or pentatonic scale. Sequences – a repeated pattern of notes moving up and down the scale. Melodic patterns – a repetitive pattern or figure that can be used with any scale, similar to sequences but more sophisticated. Double Stops – two notes played at the same time. Triads – 3 note chords. 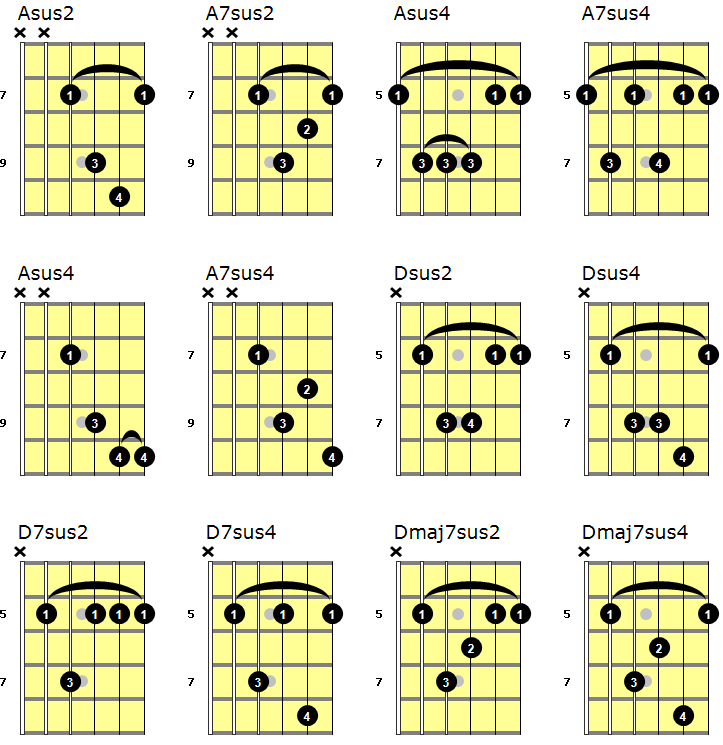 Arpeggios – chords played one note at a time. Phrasing – the equivalent of creating sentences and paragraphs with music instead of words. This is the key to how fine improvisers say something with their music. Each of these tools are covered in other lessons. Phrasing is the most important part of improvisation. With good phrasing, you will actually say something with your music, and people will understand what you’re saying. Music is a language, and like any language, its goal is to communicate. When you speak or write, you are communicating ideas by using words in a logical and articulate fashion. It’s no different in music. Notes are like words, and many notes can be strung together to form a lick (or motif), just like you’d string many words together to form a sentence. Then, just as you’d combine several sentences to form a paragraph that communicates an idea, licks can be strung together to create a phrase, a musical passage that has a complete musical sense of its own, and can be used to form large sections of related musical passages that convey musical ideas. The best improvisers perform guitar solos that sound like a coherent collection of musical phrases – their solos almost sound “planned”. That’s because they have become fluent in the language of music, and they can improvise music the same way you might speak your native language. You know your spoken language so well that you don’t even have to think about how to pronounce the words, or how to put them together to convey basic ideas. More complicated ideas might be harder to express, and require more studying and learning on your part. It’s exactly the same in music. You need to learn your scales, melodic patterns and arpeggios so well that you don’t have to think about how to play them, and you need to learn vocabulary so that you can put notes together to convey ideas. The more complicated the idea, the more vocabulary you need to know. Just like you learned a spoken language by listening to and copying others, so too should you learn improvisation by listening to and copying others. Many guitarists start out concerned that if they learn what was played by others, they won’t develop their own musical voice and will end up sounding like someone else. But this is not necessarily true. Just as you have learned to speak with your own voice despite a lifetime of copying others, you will probably learn to play guitar with your own style as well. Your style will be a mixture of all the things you listen to and learn from, along with your own sense of taste and style. Many great innovators have brought something brand new to the table, but it is always rooted in the music of their past. Learning the music of others is important in helping you develop your own vocabulary. Just as you wouldn’t speak by inventing your own words and your own language from nothing (which wouldn’t make sense to anyone but you), you don’t learn to play music by playing whatever you randomly want. At the same time, you probably don’t speak like a robot, and you don’t want to play music like a robot either. Learn the vocabulary of others and learn it well, and then add your own voice to it by changing it in ways that make sense to you. This way, you say musical things in a way that people are familiar with and understand, but can add your own voice at the same time. It’s a good idea to take into account the audience you intend to communicate with. Don’t play a jazz solo over a heavy metal song, or vice versa. Learning the vocabulary of a genre or a style is a little like learning different spoken languages. Fortunately, we guitarists have the advantage of being able to use the same notes (words) in all genres, we just have to use them in different ways to speak the language of that genre. As you continue practicing and playing and improvising, you will come to learn and anticipate the sounds you’re going to make on your guitar, just like you have learned and can anticipate the words you’re going to speak before you say them. You will also learn style, and just as you speak with a wide range of tones of voice, you will learn to play with a wide variety of inflections and embellishments, such as slides, bends, and vibrato. You might start by improvising somewhat randomly, not exactly knowing what you’re saying (or maybe knowing what you want to say, but not knowing how to say it), but eventually you will start playing deliberate phrases, combining them together to make deliberate musical paragraphs. At that point you will know that you are speaking the language of music and you will communicate with it. This is the holy grail of musical accomplishment, and the good news is, any guitarist can learn how to do it. All it takes is time and practice. The bottom line: the best way to learn how to speak is to actually speak, and the best way to learn how to improvise is to actually improvise. Put on your favorite songs or backing tracks and get busy improvising. Play licks, melodic patterns, triads, arpeggios, double stops…everything that you’ve learned. Learn new things all the time; there is a wealth of great improvisation out there, so much that you couldn’t possibly listen to it all. Combine, improvise, phrase, experiment, make mistakes, try again, put your soul and feelings into it and say something with your music. Music is communication; improvisation is a special way of communicating (as opposed to pre-written music). Don’t play everything you know in every solo, just like you wouldn’t use every word you know in every speech. Listen to yourself as you play – develop the idea you just played. Does your playing contain too much tension, or too much release? Strive for balance to keep things interesting yet relatable. We can remember what we just said. Can you remember what you just played? Are you rambling? Would you ramble on with words the way you do with notes? Every time you improvise, you have a chance to say something. Do you? Your instrument is merely a means of delivering the thoughts of your mind, just like your mouth. Your mouth is for speaking your language (or singing! ), and your instrument is for speaking music. Make your melodic lines sing through your instrument. Your goal: to reproduce instantaneously on your instrument what you hear in your mind. The Western system of music divides the octave into twelve equal semitones, or half steps. A whole step is two half steps. These twelve tones are called the chromatic scale. On the guitar neck, one half step is one fret and one whole step is two frets. A note is sharp (#) if it is raised by one half step, and it is flat (b) if it is lowered one half step. Many notes have the potential to be called enharmonic, when one note could be called by more than one name. For example, G# is the same note as Ab, and B# is the same note as C.
It’s important for every guitarist to know every single note on all the strings. By being completely familiar with your musical surroundings, you will be far more articulate, inventive, and intelligent in your guitar playing. Knowing the names of the notes in the chromatic scale, it is possible to determine what every note on the neck is. An excellent exercise is to play a note anywhere on the neck and try to name it as quickly as you can. Another good exercise is to play chords with many different root notes, naming the chords as you go. Try to be as random as possible in both exercises. The guitar is one of the most popular instruments in America, and for good reason – it’s so much fun to play! If you want to build a broad foundation of skills, or just learn how to play your favorite songs, I’ll design a course of study that’s just right for you or your child. My name is Mike Kohary, and with over 30 years of experience playing and teaching in the greater Seattle and Bellevue areas, I’ll make sure you have fun learning to play an instrument that will provide you with a lifetime of enjoyment! © 2019 Kohary Guitar Instruction. All Rights Reserved.